Storms do not cause tree problems, they reveal them. Trees falling in thunderstorms are common, with the vast majority of these trees having some predisposing factor that led to the failure. Tree branches failing during storms is the most common problem, this can result in hazardous hanging branches. 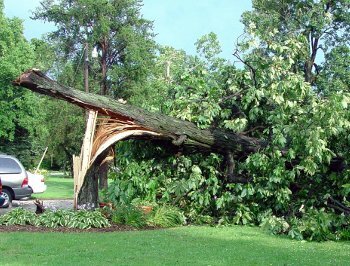 Whole tree failure occurs when the entire tree -trunk, limbs, leaves- all come down. Most of these cases are a result of some tree trunk or root system issue. Inspect your trees and know the warning signs. Trees with a significant lean or a lean that has increased – Where is it leaning? A tree will most likely fall in the direction of the lean. Does it lean over your property putting your home at risk? Is it still properly anchored by the root system? Root plate lifting/heaving – This happens when the tree has a severe lean and the soil has become waterlogged, the roots lift from the soil. They can break and cause an unsafe foundation for the tree. Are your trees roots broken and protruding from a leaning tree? Water logged soils – Soil that is too wet coupled with harsh storm winds can allow root plates to fail during storms. Make sure you have proper drainage around your large trees. Mushrooms around the base or trunk – Fungal growth on your tree is never good. When caught in the early stages, your tree can live with proper care. But if the fungus sets in, it can cause the wood of the tree to rot, weakening the base and roots of the tree. Recent root severing – The roots of the tree are what anchor it into the ground, severing them creates a weak anchor and leaves the tree susceptible to other diseases and pests. Site alterations (within ten years) – Construction damage like soil compaction, root damage, improper pruning cuts, or cuts to the trunk of the tree from equipment can leave the tree open to disease which weakens the strength of the tree. Whole tree failure is not as common as canopy failure, where large branches and limbs break off during storms. There are several different causes for canopy failure. Tree species known for limb and branch failure (Maple, Poplar, Bradford Pear, etc) – Have you pruned your trees this year? Leaves act like sails in the wind, if your branches do not allow proper air-flow through the trees it can lead to branches failing during storms. Poor structural forms – Does your tree break off into multiple main stems? V-shaped attachments with included bark are weaker than U-shaped attachments, which are better at withstanding strong winds. Included bark – Branches or stems that have formed with bark in the middle are magnets for decay, they also are not as structurally sound. Decay in the trunk or limb – Disease can attack any part of a tree. Poor air-flow through branches creates a fungal breeding ground, improper pruning cuts do not allow the tree to heal inviting in bugs, disease, and decay, and fungal growth at the base of the tree can spread through the canopy. Dead limbs – Are there limbs that don’t produce any foliage? These limbs are already weakened and pose a risk of falling. Prune your trees regularly – Pruning removes dead, dying or diseased branches; thinning lightens the weight of the canopy and allows air to flow through the branches during storms with strong winds. Fertilize your trees – In a natural forest environment, the tree receives nutrients from decomposing plants on the forest floor. But in an urban environment we remove tree debris and must replace those nutrients. Consult an ISA Certified Arborist – An ISA Certified Arborist is trained in all aspects of tree care and health, a regular inspection can help prevent any issues homeowners are not familiar with. An Arborist can also prescribe treatments for diseases and pests, before they become a hazard. A regular inspection of your trees by a trained arborist is the best insurance for minimizing risk. Protect your trees health with regular pruning and fertilization and always consult an ISA Certified Arborist before beginning construction on your property. Call Heath Tree Service and schedule an appointment today! 404.261.5000.